The end of the regular PGA Tour season is near as many players turn their attention to the Fed-Ex Cup Play-Offs which starts next week but before that we head over to North Carolina for the Wyndham Championship. The top 125 players in the Fex-Ex Cup standings after this week make it into the play-offs where they will contest for huge amounts of money, so obviously there is a huge incentive this week for those who are currently ranked outside the top 125 to perform well. Not only that but those who are ranked outside the top 125 on the PGA Tour Money List or the Fed-Ex Cup standings after this event that have not won an event in the past three years will not have guaranteed their card for the following season, so again a big incentive for those guys to perform well this week. Despite this the big names have dominated the Wyndham Championship over recent years, Patrick Reed, Sergio Garcia, Webb Simpson, Carl Pettersson and Brandt Snedeker have all won this event in the last seven years. However in 2010 this event witnessed one of the biggest surprises in PGA Tour history when Arjun Atwal became the first Monday qualifier to emerge victorious on the PGA Tour in 24 years. Sedgefield Country Club in North Carolina is a Donald Ross designed course which hosted this event way back in 1938 and it did so for over four decades before the tournament moved to Forest Oaks in 1976. 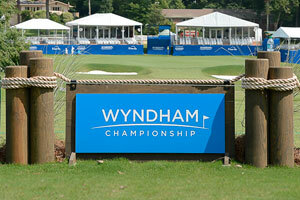 In 2007 Sedgefield Country Club was restored and modernized which cost a total of $3million, the following year The Wyndham Championships was held at Sedgefield Country Club for the first time in over 30 years. The course itself is a par 70 that will play 7130 yards, length is not essential and the fairways are tree lined which suggests that the more accurate players will fare well this week. Finally putting is as important as ever, the better putters on the PGA Tour have performed well in this tournament in recent years including the likes of Patrick Reed, Webb Simpson and Ryan Moore who have all won this event recently. Brandt Snedeker is the favourite to win this week in American at 16/1, he won this tournament back in 2007 and has returned to form as of late. The Memorial winner Hideki Matsuyama is the second favourite after making eight of his last eight cuts, you can back Hideki at 20/1 which is pretty short in my opinion. Ryder Cup hopeful Webb Simpson now needs a wildcard to make the USA Ryder Cup team, the American will be looking to impress this week to increase his chances, Webb is the third favourite at 20/1. Finally you can back Patrick Reed at 25/1 who has already made the USA Ryder Cup team largely down to his two wins this year. Brendon De Jonge – De Jonge is a player I probably back too often but I feel he has a great chance of claiming his first PGA Tour title this week. De Jonge’s best finishes this year have been in the Wells Fargo Championship when he finished in 6th position and the Quicken Loans National when he finished in 8th position. He comes into this week after some good results, he finished 37th in the WGC Bridgestone Invitational a couple of weeks ago and 41st last week in the PGA Championship. De Jonge played very well from tee to green around Valhalla hitting 69.44% of greens in regulation which suggests he is playing well. De Jonge’s course form is not outstanding but he did finish 14th in this tournament in 2012 which suggest he can perform well around this course. Driving Accuracy is pretty important this week and Brendon is ranked 22nd on the PGA Tour in terms of driving accuracy, also last week at Valhalla he hit more fairways than any other player. Stephen Gallacher – Gallacher is a very big 100/1 this week which I cannot understand, 66/1 would have been a fair price in my opinion. Gallacher is eager to make the European Ryder Cup side and he will know a good performance this week will only increase his chances. Gallacher is having the best year of his career, earlier in the season he won the Omega Dubai Desert Classic in a world class field including the likes of Rory McIlroy and Thomas Bjorn, he certainly has the potential to win the Wyndham Championship. Stephen also finished 6th in the WGC Cadillac Championship and 5th in the BMW PGA Championship which shows he is capable of competing with the best players in the world. Admittedly Gallacher missed the cut last week which has led to these generous odds, in the opening round he shot 70 which suggests his game was not too far away. Not so long ago Gallacher finished 4th in the Scottish Open then the following week 14th in the Open Championship. Putting has proved to be important in this tournament in recent years, Gallacher is a decent putter averaging 1.762 putts per green in regulation hit which ranks him in 47th position on the European Tour. Scott Brown – Brown is another player whose chances I rate better than 100/1, once again I think 66/1 would be fair odds. He recorded his first win on the PGA Tour last year and has really improved as a player since. In the 22 events Scott has played in he has recorded five top 25 finishes, this also includes a couple of top ten finishes as well as a 13th place finish in the Memorial Tournament. Brown does come into this week in good form, he finished in 5th position in the John Deere Classic, he then followed that up by finishing 20th in Canada and last week he finished 47th in the US PGA Championship. This was his best ever finish in a major despite the course not suiting his game, he played well from tee to green hitting 65.28% of greens in regulation which is impressive considering the length of the course. Sedgefield is not close to being as long as Valhalla which will favour Brown who is not long off the tee, the fairways are treelined so driving accuracy is pretty important and Brown is ranked 29th on the PGA Tour in terms of driving accuracy this year.